Brian Reed and Lee Weeks offer a contemporary take on Captain Marvel in "Farewell," an all-too brief peek into the character's inner workings. For such a short tale, it covers quite a bit of ground but suffers undeniably from the strict page restriction. Reed's story barely manages to gain traction when it's hastily drawn to a conclusion. Weeks, meanwhile, is an artist I've seen floundering around the outer rim of mainstream comics for years now. I'd never been particularly taken by his contributions before, but he shows quite a bit of improvement here, especially near the end of the tale. Truthfully, his style seems to click around the third page and improve rapidly through the story's end. Mike Carey and Timothy Green III's "In Plain Sight" is a bit more suited to the medium, offering a handful of brief flashbacks through the green-haired SWORD Agent Brand's life as she floats helplessly through space. If nothing else, it's a good fit for the format, and it makes for a fine change of pace from the more straightforward superheroics of the preceding tale. Green's artwork fits right in with that motif, delivering a tight, highly gestural style that reminds me a lot of Peter Chung's work with Aeon Flux when it was still on Liquid Television. It's totally different from what Lee Weeks was doing earlier in the issue, and that suits the tone of this story just fine. Christos N. Gage and Mike Perkins follow that up with a throwback to the old days, as they follow the Skrull Beast and the real(?) Wonder Man in an adventure immediately following the T-Rex attack from Secret Invasion #2. For fans of the characters in their heyday this might tug on a few heart strings, but as a reader with little interest in either of their shared histories, I found it to be quite a drag. Gage's writing is excessively verbose and not all that captivating, while Perkins's artwork is cheesy and antiquated. All things considered, there was really nothing wrong with most of the individual stories contained within this issue, but as a whole I found it to be a disjointed, confusing read. 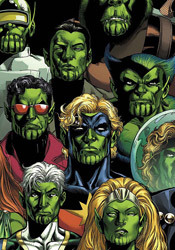 The Captain Marvel tale encourages us to pick up Secret Invasion #1 to continue the story, but the Beast / Captain Marvel adventure takes place after the events of Secret Invasion #2. I have no idea where some of the other stories fit into the timeline. The creative teams, too, deliver work that is generally very good on an individual level, but doesn't match what had come before, and universally suffers from a lack of consequence. If you're really, really crazy about the alien invasion that's going on right now, you may be interested in the additional back-stories contained in this issue. But if you're like me, curious about the main plotline but not quite all that taken by the variety of tie-ins, you'll want to give this a pass. It's more than forty pages of filler. Entertaining filler? Occasionally... but it's filler nonetheless. Skip it.